Last week was a historic, and for some an emotional week. Wiltshire was saying goodbye to the fleet of Hercules C130s (or should that be Herculi?) that have been stationed at RAF Lyneham for over 40 years as part of the RAFs Tactical Air Transport force.There can't be many people in the County who haven't, at some time or other, seen one of the Fat Alberts, as they are affectionately known, lumbering across the sky, surprisingly quiet for such a monstrous aircraft. For the past decade we've all become accustomed to seeing them on the television, discharging their tragic payload of fallen soldiers from Iraq and Afghanistan through the rear door but for the people of Wiltshire they hold a special place in their hearts and their history. Over the past few years the repatriations to Lyneham, then the sad, slow procession through Wootton Bassett, a town recently and deservedly awarded a Royal Charter for the dignified way in which they have honoured our war dead, have been a disconcerting staple of weekly news bulletins. But not any more. For reasons that I don't know, the Ministry of Defence has decided to close RAF Lyneham, with the loss of nearly over 2000 service and civilian posts. Those who survive the cuts have been transferred to RAF Brize Norton in Oxfordshire. Alongside all the service personnel who will move across the border are their families. The impact on what is basically a village with an RAF base will be huge. There are question marks over local businesses, over whether the local school will be able to stay open with the loss of so many pupils. The hole in the local economy is estimated at around £90 million pounds. Times are tough for the MoD, although how much of it is self-inflicted is open to debate, and we all know that savings have to be made but to me, closing a base which has become so much an integral part of our recent military history, just seems a little ungrateful. Repatriations took place to Brize Norton up until 2007 but it was only after the move to Lyneham that the public took it on themselves to turn out to honour the servicemen and women killed in Iraq and Afghanistan and the 'spectacle' of the repatriations to Wootton Bassett began. It's not everyone's cup of tea but I always felt that it must have been some comfort to the families to know that there were so many ordinary people who wanted to show their public support for the price their children had paid for this ridiculous war. So on Friday, camera in hand, I set off to try and capture my own photograph of the Fat Alberts as they did a low level flypast across the county to say goodbye and thank you to the people who have supported them for so many years. I've always been a bit of an anorak about military planes, maybe it was the result of a childhood spent at the Biggin Hill Air Show or planespotting, and then later on digs for downed WWII aircraft. They set off from Lyneham at 10.30, taking a slight detour up to Tetbury in Gloucestershire where someone with power and influence had asked them to fly over his house, then on to Avebury, Calne, Devizes, Warminster, Melksham, Trowbridge, Colerne, Wootton Bassett and Malmesbury, before heading over Swindon to Brize. The local radio station had a reporter in the lead Hercules, being flown by the Station Commander, Squadron Leader John Gladstone, who reported minute by minute. A friend of a friend was the air traffic controller who authorised the final take off. What a sad moment that must have been. Across the county thousands had turned out to wave goodbye. In Wootton Bassett primary school the children stood out in the playground and formed the word 'BYE' in big letters. The airmen were so touched as they flew directly overhead. No-one was entirely sure which route the Hercs would take so I opted for a high spot just outside town. I guessed roughly what time they would reach us. 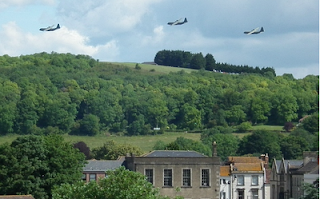 I was a few moment out as just as I arrived at my vantage point, I spotted them flying low across the town then banking off around Battlesbury Hill. I stopped my car at the side of the road to take a photo but the damned focus on the camera jammed and I missed them. Every lane and every layby had someone parked up, faces turned skywards, watching the Fat Alberts fly overhead. People waved and shouted. I was on my way to a meeting so I turned the car round and cursed my camera, which I flung into the back of the car. 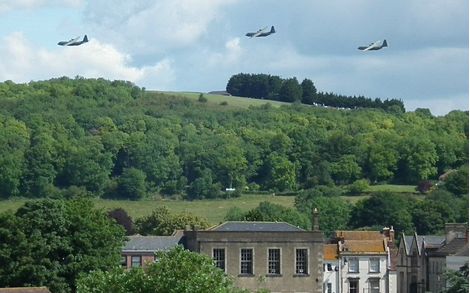 I'd hardly gone 200 meters when the Hercs appeared again from the other side of the hill then banked majestically off towards the Somerset Levels. I nearly ran into a hedge as I scrabbled for my phone to take a photo with that. I missed them again but did have the bejesus scared out of me by a low level helicopter that was following the flight a few minutes behind. It was so low I could practically see the whites of the pilot's eyes. I carried on listening to the broadcast from the sky. The reporter was really struggling to keep his emotions in check and it was difficult not to get drawn in to the emotion of the moment as they headed towards the Oxfordshire border. Rather symbolically, I thought, at the very moment they passed over the border, radio contact was lost and by the time the link was repaired they had already landed at Brize and where preparing for the handover of the standard. Edit: Just in case you were curious about how they came to be known as 'Fat Alberts', I can now reveal, da NAAAH, thanks to my Rock Choir buddy Liz's husband Jon, an ex Herc pilot, the story behind the name. Back in the days of flared trousers and Farrah Fawcett, the US airforce had a blue Herc that was used as a support plane, and which they nicknamed 'Fat Albert'. When the RAF heard about it they adopted the name for their fleet of Hercs. So there you have it. You never know, it might just win you a Pub Quiz. Bless you, I can just picture you scrabbling to take the photos... bliddy technology!! The name Fat Albert makes me laugh... sorry, no laughing matter. You captured well the end of an era. Apparently it's now £6.3bn that the MoD have not kept track of. Wish it would make tracks my way. RotN - damn, and there's me thinking that it was just another garden planter. Better get my geraniums out of the turret!